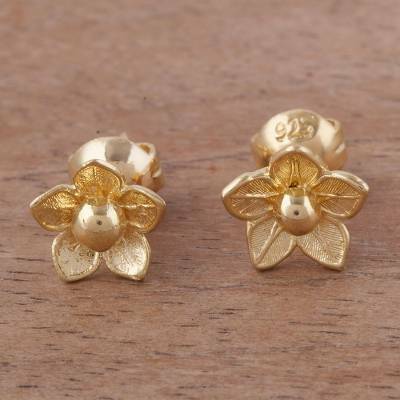 Flower-Shaped 18k Gold Plated Stud Earrings from Peru, "Glistening Petals"
Two petite, blooming flowers are crafted of sterling silver with an 18k gold plating, accentuated by a distinguished level of detail. These dainty stud earrings are designed and crafted by Peruvian artisan Marianela Vargas. You can find gold plated sterling silver stud earrings 'Glistening Petals' by Marianela Vargas in jewelry categories such as Floral Earrings, No Stone Earrings, Gold Earrings, Gold Plated Earrings, Silver Earrings, Sterling Silver Earrings and Stud Earrings. Enjoy exploring these sections for other Novica treasures.